I wanted to write a piece about China because it is such an interesting country and I have met few people that aren’t fascinated by it in some way. China is well and truly on the western consciousness. Perhaps because many predict it will be the world’s next super power, if it isn’t already. I mean China own a lot of the world’s resources. The tales we get told in the Western media are often negative, human rights abuses, pollution, poisoned baby formula. Certainly the stories I had heard about China alienated me. The distance between the Chinese world and my own seemed immense. And well, there are more than a billion people there, so that’s a lot of people doing things differently. China ended up surprising me in more ways than one and in the end I really loved cycling there. We both did. Here are some of the things that made China great, weird, amusing and at times also frustrating. The people. It’s such a traveller’s cliché, but the people really made China the experience it was, which was overwhelmingly positive. The Chinese are very hospitable, everyone wants to talk to you, even though most people can’t speak English. We were constantly given food, smiles, waves and were never aloud to pay if someone took us out to dinner. When we were stuck, people went out of their way to help us, often phoning someone who could speak English. The photos. This gets tiring. Like many places we have visited, everyone wants a photo with the white people on bikes. We began calling this being photoknapped as people would literally pull over on the side of the highway for a photo shoot with us. Other times they would slow right down, an i pad would be hung out the window, a photo snapped and the car would speed off again. Hot Water. The Chinese have a serious tea obsession. This is wonderful because it means boiling water is available absolutely everywhere. Petrol stations, train stations, trains, and most certainly it is unheard of having a hotel room without a kettle. You get free tea most of the time too. Toilets. Ah, the toilets. For a country that is developing in leaps and bounds and managed to build the unbuildable railway to Lhasa, they are seriously lacking in sanitation infrastructure. Most of the time you get a wooden floor with a rectangle cut into it. Sometimes this is piled to the top with poo. Sometimes there is poo all over the floor. Sometimes you are literally peeing or pooing into the river below. Pretty gross, although being in Central Asia at the moment has totally desensitised me to even another level. The food. Chinese food is nothing like the greasy takeaway I knew from home. It’s amazing and diverse and oh so cheap if bought from the street. The drivers. The driving is terrible. People have very little concept of road rules. Signs and traffic lights appear to be more of a suggestion than anything else. Honking is endemic and it appears to give you the right to drive at people. Also, every single truck will honk at you while cycling. The only time people don’t honk is when they are on silent ninja (electric bikes) that creep up behind you. Ah the logic! The infrastructure. China is set to have more high speed rail in the coming years than the rest of the world combined. Coming from country that hasn’t seriously updated it’s rail network since early last century, this is awesome. There are so many rail projects. The trains go almost everywhere and are cheap and efficient. It’s impressive how China moves it’s over a billion citizens. Public transport in the cities is also remarkable. Cheap and plentiful. Roads are mostly in great condition. There are often quieter secondary roads as well, especially in provinces like Yunnan. The paranoia. Far out. It is not the Qing dynasty! Foreigners are not pillaging your land and taking what they want. China, you own the world. Relax. This paranoia refers mainly to the initial visa process (which requires a billion things) and the fact that in many provinces only some hotels allow foreigners to stay. The cheap ones are often only for locals and we sometimes spent hours in the rain looking for a hotel. Plus you are supposed to register within 72 hours of arrival in the country. In some provinces you get moved on when you camp, and have your passport obsessively checked and asked where you will be spending the night. To buy a mobile SIM card you can only go to the larger outlets as only they can register foreigners. Also, needing written police permission to buy fuel for our stove seemed rather over the top. It seems that rules are either ignored or followed obsessively, and as a foreigner it’s difficult to know when either will apply. After months of this it gets a little tiresome. Apparently China wants to become the tourist destination. I feel like a few things would have to change before this happens! The Environment. Disclaimer: We only went to the least populated provinces of China – Yunnan, Sichuan, Gansu and Xinjiang. China is beautiful and diverse. From the jungles of Yunnan, to high mountains, grasslands, desserts and lakes. China was a lot cleaner and less populated than we expected. The opportunities for cycle touring are almost endless. The censorship: Facebook, WordPress, u tube and even American tv shows like The Big Bang Theory are considered subversive by the government and censored. Unfortunately a lot of Chinese didn’t know about VPN’s (vertical private networks), which can circumvent some blocks. Fundamentally I think censorship is wrong, however, I think in the west we are censored in a different way. In China it is more overt. Everyone knows the government blocks websites. In Australia (and many other western countries) we are led to believe we are consuming good media, when in actual fact a lot of our media outlets are owned by multinationals with a distinct agenda (Murdoch for instance) which is as bad, if not worse than blatant censorship. Contrast. China is a land of contrasts. In one minute it is so familiar, so modern, it could be the west. The next it is so alien you feel slightly dizzy. One minute you are surrounded by Chinese tourists with two SLR Cannon’s wearing Northface. The next, you are watching an old man herding goats on a remote mountain pass. China is the future as much as it is the past. Tourism. After SE Asia where almost all tourism is aimed at foreigners, China is refreshing. SE Asia has ‘white people/foreigner’ prices. China has ‘tourist’ prices. This means all tourists, foreign and Chinese get ripped off equally. Oh and ripped off you get. The entry fee for many attractions is insane. Also, by far the majority of tourists in China are domestic which means even in tourist towns not many people speak English or cater to western tastes (read western cafes and food, usual to most SE Asian tourist towns). This is kind of nice. You also cannot be a student unless you are under 24, despite having a student card. Go figure. Politics. Due to the language barrier it is hard to get a sense of how people feel in regards to politics and human rights. In Xinjiang you definitely feel the tension after a while. I mean, we were constantly getting our passports scrutinised and the police were everywhere. Most of the time the Chinese and Uyghur don’t seem to mix. It was similar in the Tibetan region, but not as tense. It’s hard to talk to people about these things and you often get very one-dimensional answers. The parks. Chinese people use their parks and public spaces to the fullest. They really embrace them. Walk through almost any Chinese park or public space and you will see all manner of things; old men in Mao hats drinking tea and playing Majong, groups of colourfully dressed middle aged ladies line dancing to Chinese pop music, ballroom dancing couples, people practicing their instruments or singing, or even a mock catwalk. The spitting. Perhaps a Chinese cliche but the spitting is intense. For most of the older generation, as well as some of the younger its perfectly acceptable to spit anywhere, usually meaning the street, sometimes meaning the floors of restaurant. While the spitting itself is quite gross, the hacking up of the spit in the back of the throat is probably worse. We once stayed at a hostel where one of the staff would alternate between smoking and hacking/spitting, pretty much the whole day. I have been assured that spitting is seen as not cool by the most of the younger educated generation and that it is fading out slowly as being sociably acceptable. Coffee. A true tragedy. The Chinese don’t get coffee at all. I sampled some truly heartbreaking attempts in my 3 months in China. And the supermarkets only ever stock Nestle. Sad, sad, sad. I’m sure this is different in the big cities. The cyclists. China has a growing middle class and on any given weekend you will find groups of Chinese on cycle trips. They all ride Giant or Merida bikes and took great delight in chaperoning us. This inevitably always ends in a photo shoot. Cycle touring is also growing in popularity. 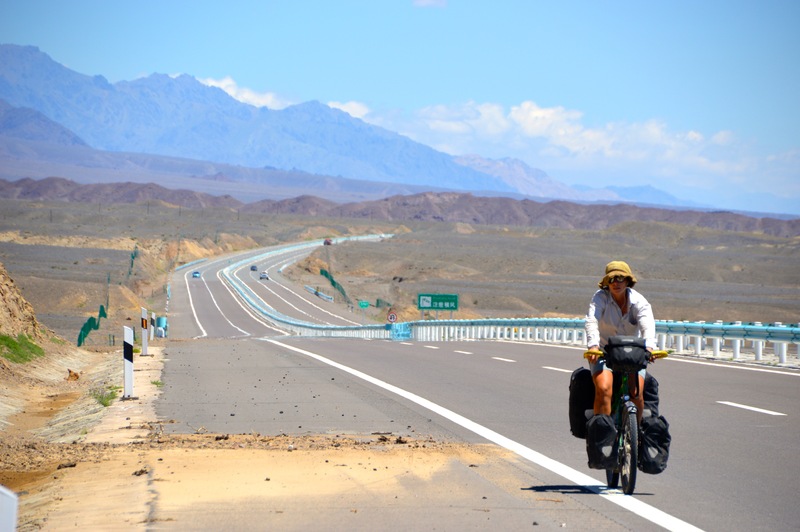 Chinese cycle tourists never have rear panniers and always appear to be wearing all their clothes, even in the desert. The staring. The Chinese are a nation of starers. Well, at least that was our experience. Opened mouthed, wide eyed, unabashed staring at the foreigners on bikes, or just walking around. One lady stared so intensely she nearly fell of her bike. I don’t think they are meaning to be rude, it’s just part of what they do. It’s not creepy either, in the way we get stared at by some men in other countries. Chinese men haven’t been sleazy really at all, which is saying a lot because almost everywhere else they have. The women stare just as much as the men do. Strangely, the Chinese reminded me of American’s in some ways. In the way that some American’s can be very inward looking and insular, consumed by their culture and perceived central location in the world with very little knowledge of what lies beyond their borders. The Chinese can be like this too and the similarity is obvious. They too live in a large, populous country, with a fierce cultural dogma and are insulated in a lot of ways from the rest of the world. An example of this was when a girl in the mobile phone shop couldn’t comprehend that my phone wasn’t in Chinese, or when it is assumed that if you can’t speak Chinese, you must be able to at least read Chinese characters!